I’m always glad when Viz puts out stealth josei under the Shojo Beat imprint, and while it might mean only one josei series from them running every year or so, I’ll take what I can get. 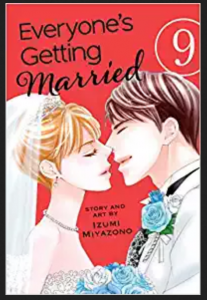 The final volume of Everyone’s Getting Married reminded me a bunch of a last episode of a Korean drama, because Ryu and Asuka keep quasi breaking up and getting back together after long periods of time pass. Couples separating and reconciling in a dramatic fashion after many years is such a Korean drama staple! All along, Ryu’s fervent opposition to marriage and Asuka’s total commitment to becoming a homemaker as her ultimate goal created plenty of dramatic tension throughout the series. It was difficult to envision a happy ending where both of them would be fulfilled, but this final volume showed in an episodic fashion how their personalities shifted a bit after they paused their relationship. Asuka started finding more fulfillment and rewards at work, while Ryu realized that he can’t be solely committed to his career. It takes the wedding of an equally unlikely couple, Rio and Hiroki, to bring Asuka and Ryu back together for good. This volume was much more episodic in nature than previous volumes, with the story unfolding more like a series of vignettes. I put down this volume appreciating all the emotional depth Miyazono brought to the story. Since most of the Shojo Beat imprint focuses on high school romance, it was refreshing to have a series featuring adults dealing with relationships and commitment issues. Now I’ve just got to be patient for fall when the Maki Enjoji series An Incurable Case of Love comes out for my next mainstream josei fix from Viz.